Ivor W. Hartmann (ed. ), AfroSF: Science Fiction by African Writers. Story Time, 2012. Pp. 390. ISBN 978-0-9870089-5-4. $9.99. This anthology is edited by Zimbabwean author, editor and publisher Ivor W. Hartmann and published as an e-book by the small press Story Time in the beginning of December 2012. Hartmann writes in the introduction that the publisher will consider a print version to follow in 2013. The anthology contains twenty-one short stories of various lengths (I found out later that the Zimbabwean author Tendai Huchu is also contributing to the anthology, but the story unfortunately wasn’t in the version I received) in addition to one novelette, and a broad range of themes that will make any fan of science fiction happy. You get such subgenres as Cyberpunk, Biopunk, Military, Hard, Soft, Apocalyptic, Comic. You get stories that range from the darkest dystopian high-tech society to space opera, the aliens’ invasion of Earth or humans’ colonisation of other planets, time travel and pharmaceutical corporations’ grip on mankind. I was delighted when this anthology came into my mail box. Being both a fan of the science fiction genres and having an African background, I was curious about how these two elements would bring new perspectives to each other. Being brought up with science fiction literature mainly from US and Europe, I looked forward to read stories from another perspective. Several of the stories herein are excellent science fiction, amongst them ‘Home Affairs’ by Sarah Lotz. Lotz also goes under the writer names S.L. Grey and Lily Herne. Lotz tells an almost Kafkaesque tale of a surreal future South African society where robots are the new efficient and non-corrupt bureaucracy. The main character, Pendi, finds out it is not wise to attempt to talk sense to robots. Lotz is a great storyteller and writes with a brilliant sense of dark humour. I have no difficulties with identifying with Pendi in her struggle and feeling of helplessness in meeting with an inflexible system. I really liked this piece. Another brilliant story in my opinion is ‘Five Sets of Hands’ by Cristy Zinn. This story takes us to Mars. One race has enslaved another, which is forced to dig in the earth in the naked, lifeless Borderland, searching for ancient technology from the time before a terraforming went wrong there. It is a touching story about little silent Njort who yearns to be together with the five sets of hands. The story is told with warmth and humour, but with a serious undertone that comments on slavery, racism and outcasts. It is also a story about the one individual who stands up against injustice. Though Zinn has won several SF writing competitions, this story is her first published work. She is a writer I hope to see more from in the years to come. S.A. Partridge’s ‘Planet X’ was yet another story that left me speechless. This is a brilliant story about how a society reacts to the foreign and unknown. The Russians have found a new planet, Planet X, and we follow Nonhlanhla and her observations of her surroundings in the days after this discovery. Through her eyes we witness how rumours about the unknown inhabitants of Planet X evolve into wild stories, with good assistance by media, gossiping wives and preachers, and how the panic spreads into surreal madness. I read a strong political undertone in this story and there are many real life events that went through my mind when reading it. The story follows the narrative of the classic Monster story, where the villagers’ suspicions about the misunderstood monster grow into hatred and wild accusations before the village people hunt the monster down and kill it. Partridge shows us convincingly the ways of the human psychology in face of the unknown. She has won prizes for her writing and is named one of South Africa’s best up and coming authors by Mail & Guardian and Women 24. I thought the stories by Nnedi Okorafor, Liam Kruger, Joan De La Haye, Martin Stokes and Clifton Gachagua were also exceptional entertaining and well written. Okorafor writes beautifully and lyrically about the world seen through the eyes of a swordfishlike creature. Kruger writes convincingly and dark about travelling through time through the eyes of the timetraveller and we learn that it’s not necessarily beautiful new worlds a timetraveller visits. De La Haye writes disturbingly about a possible future when the government has the power to cull the population and the question about what makes a person valuable is a question of life and death. Stokes writes an excellent piece about a poacher, and supply and demand, in a time when poachers go to other planets to hunt. Gachagua writes touchingly and discomfortingly about parenthood in an alternative world. The novelette ‘Proposition 23’ by Efe Okugo is the last story in the anthology and I think it’s a good finale. It’s a story seen through the eyes of a lawman, a programmer and a terrorist. Okugo takes us to a future society where the citizens depend on technology and virtual realities, and where free will and wrongly asked questions will lead to the citizen losing the privileges and virtual connection and becoming “undead,” unclean or undesirable. The story speaks strongly about artificial intelligence, about hunger for power and about reactions to terrorism. I feel that some of the stories in this anthology are clearly stronger than others, but all in all, the anthology has many fine stories and it is difficult to pick out examples. The stories I have not mentioned here are all good reads and I would recommend this anthology to any fans of science fiction. Many of the stories also deserve to be read more widely than the audience of this collection. Hartmann has done a good job as an editor. Several of the stories are by first-timers, several by seasoned writers. I was very pleased to see that half of the authors are women, which is rare to see in SF anthologies. I was also very pleased to see that several of the stories had women as the main character. The anthology confirms that there is a growing brew of South African speculative authors, with Lauren Beukes as a leading light (she does not have a story in the anthology), and I gasp at the number of great storytellers that comes from this country. I was however very disappointed to see that as much as 90 percent of the authors in this anthology come from or are living in South-Africa (more than half of the contributors) and Nigeria, in addition to authors from Gambia, Kenya (and one from Zimbabwe, missing in my copy). This discovery made me sad as I hoped to get to know writers from all parts of Africa when I started to read the anthology. I wonder what the reasons are. Are there no science fiction writers in other parts of Africa? Didn’t non-English speaking Africans get any chance to have their stories translated and submitted? That said, both the stories and the authors are as diverse as any reader could wish for. 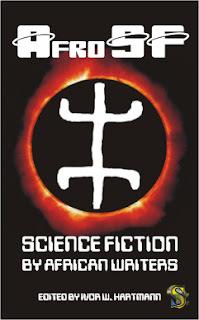 The anthology has made me ponder on the concept “African science fiction”. Is there such a thing? At first I thought I had read it all wrong, that the anthology did not promise African science fiction, but science fiction stories by African writers, that it was the title AfroSF that confused me, and that the stories in the anthology could have happened anywhere and did not differ from science fiction written in other parts of the world. But I was wrong. Africans have seldom had a part in science fiction written in US or Europe, from what I can gather. I think we are seeing the same pattern as we’ve often seen in the western portrait of Africans in popular culture, where Africa is an exotic prop for the story and Africans often are portrayed stereotypical, as sidekicks or villains. There is also the image of Africa constructed through media as a continent of wars, famine and crime. The AfroSF anthology looks us straight in the eye and challenges us on this. It gives us stories where Africans are the protagonist, the hero, the main character. It shows us that Africa is not a homogeneous country, but a multicultural and diverse continent just as all the other continents are (though I wish more countries had been represented in the anthology). It shows that Africa has more to offer than wars and famine, criminals, corruption and hopelessness, though it bears the scars of slavery and colonialism. There is one thing about this anthology I really like and that is the optimism that I sense in many of the stories. It reminds me of the science fiction stories written in the1940s and 1950s, which were great stories that debated ethics and society, and at the same time remained hopeful. The AfroSF stories have energy and a vitality that we rarely see in the western science fiction today. Though many of the stories in AfroSF are utterly dark and describe dysfunctional societies, I can’t help but become happy, because we are witnessing African writers write about and debate possible futures from their perspective. And it’s great stuff too. I hope that more African writers can be inspired to write within these genres. Both because they would bring new perspectives to the genre, but also because it can be used as a tool for Africans (and rest of world) in thinking of alternative futures and raising awareness and ethical debates about difficult topics. I’ll be cheering on the sideline.